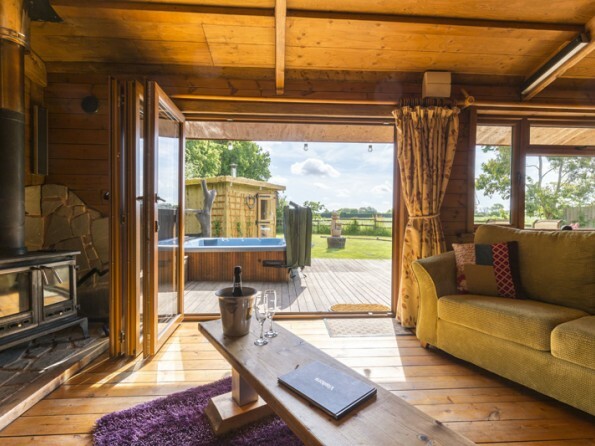 Hand built and luxuriously furnished, this beautiful and romantic adults only retreat has everything from a rainforest shower room and under floor heating to a home cinema system and a private hot tub and a handbuilt sauna. 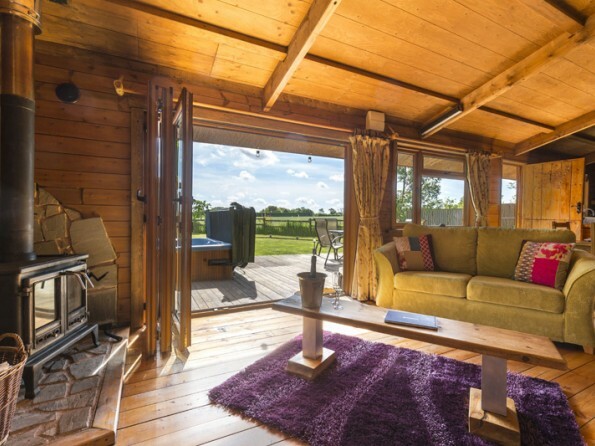 A haven of peace and tranquillity, this is country living in style. 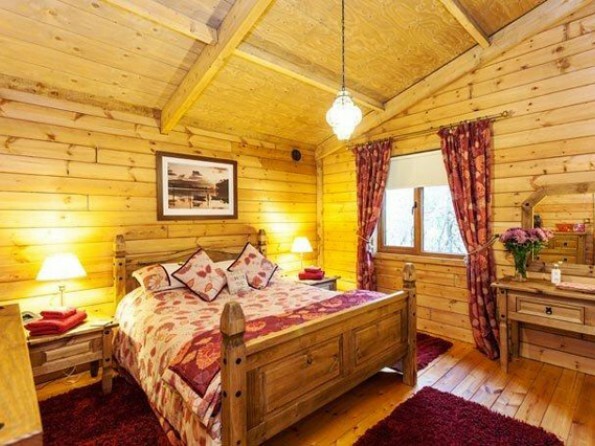 Cosy, comfortable and very well-appointed, Honey Lodge is the perfect base from which to explore the picture-perfect towns, historic attractions, local beaches and magical castles and gardens of picturesque Kent. 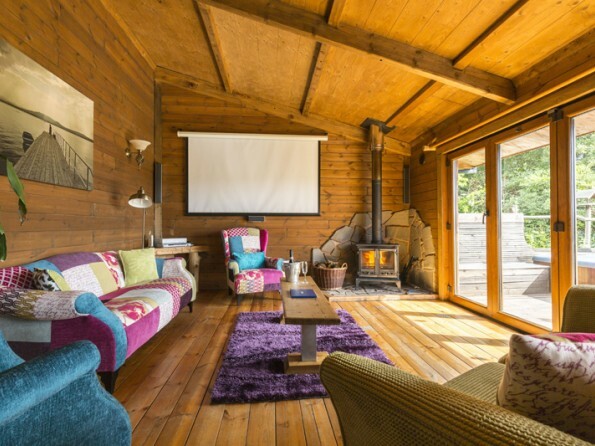 The lodge has been very thoughtfully put together - the under floor heating and log burner will keep you warm even on the coldest night, the mod cons are comprehensive (you won`t find a cinema screen and Sky TV in your average log cabin! 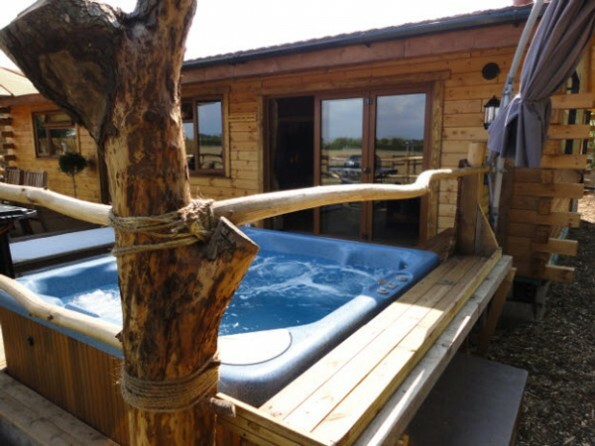 ), and the spacious hot tub is a real treat, whatever the weather. 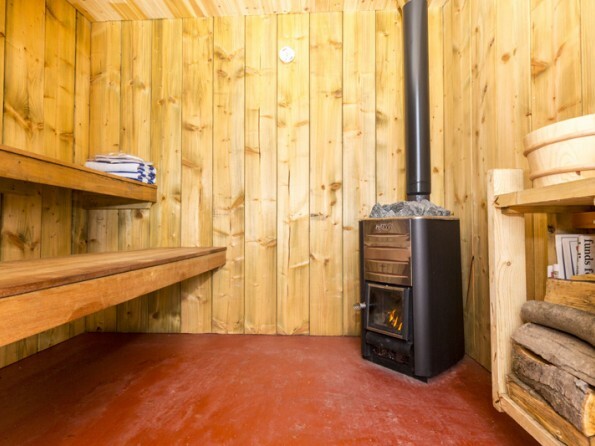 There's even a hand built bespoke wood burning Sauna. This really is the perfect place to refresh, relax and unwind with friends, family or just a special someone. 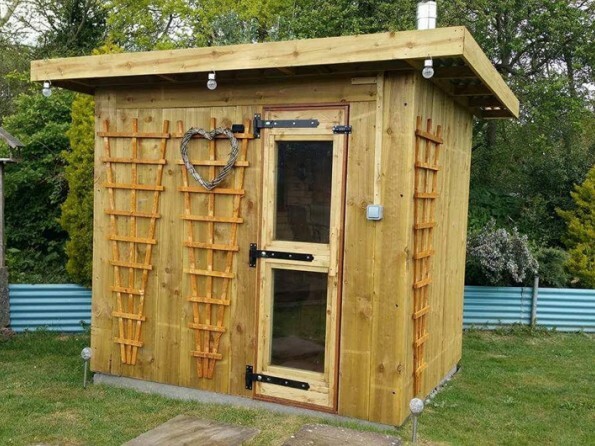 Honey Lodge is located between Whitstable and Canterbury, next door to the very popular Druidstone Wildlife Park. Although it feels tucked away, there is a family-friendly pub, the Royal Oak, just 50 yards along the road and all the many attractions of Kent are on your doorstep. It may be tempting to sink into the hot tub and stay there, but Kent, otherwise known as the garden of England, is a beautiful county with a huge amount to offer. Discover Leeds Castle, Canterbury Cathedral or the stunning gardens at Sissinghurst, or visit some of the glorious beaches at Deal, Broadstairs and Folkestone. You could go walking along the North Downs Way or the Greensand Way, perhaps the best way to enjoy the landscape, or you could tour Biddenden vineyards and explore some of the many art galleries and boutiques. The owners know the area inside out, so contact them for suggestions about what to do and where to eat. Please contact the owner for full driving directions. 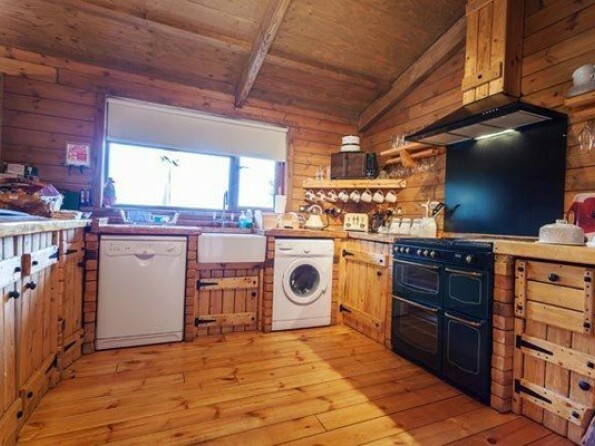 You enter through a stable door into an open plan dining/kitchen area. The rustic and bespoke kitchen is extremely well-equipped and the dining area contains an oak table and chairs for at least 6 people. The spacious lounge has bi-fold doors which lead to the deck and a large corner suite in front of a 100 inch cinema TV screen and a wood burning stove. 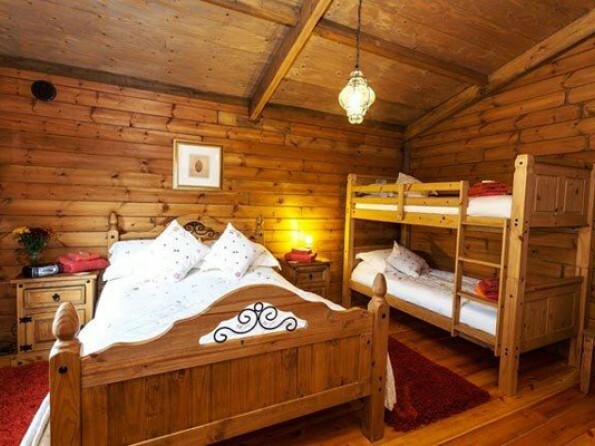 Both bedrooms have a king sized bed - one also has a copper bath and wash hand basin. There is also a double sofa bed in the lounge for groups of more than four. 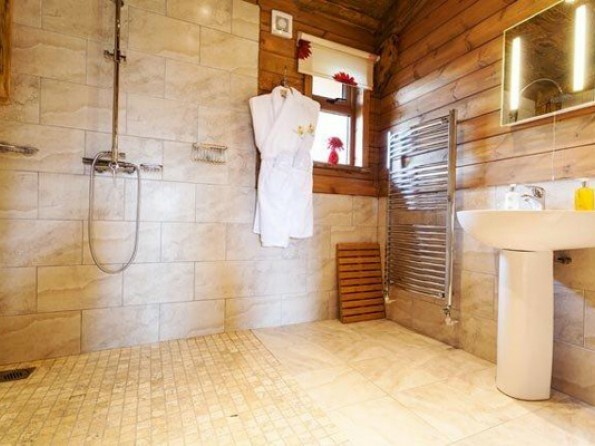 The deluxe wet room has under floor heating, two different shower heads and an endless supply of hot water. 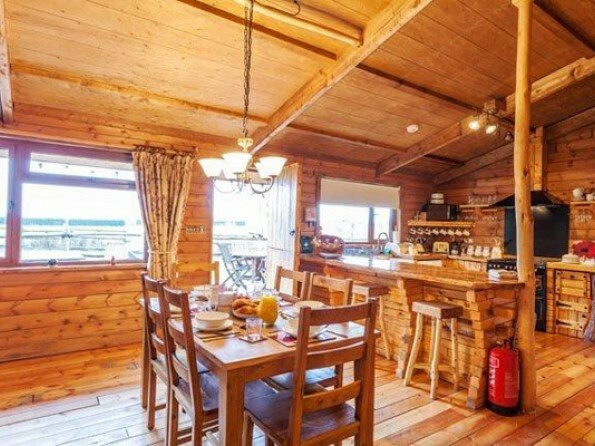 As well as the enormous television, the lodge is equipped with Satellite TV, a DVD player, a CD player, a Wii games console and wireless internet. 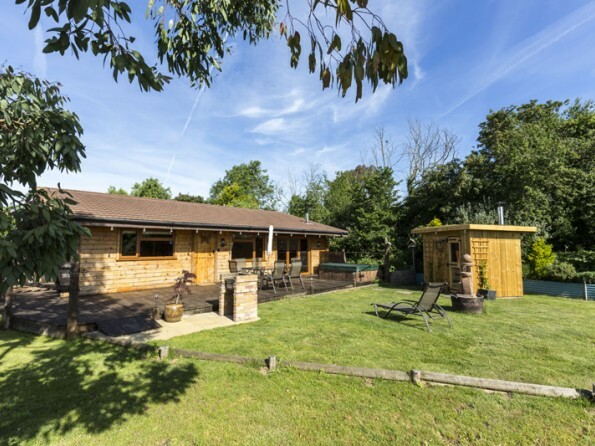 Outside the lodge are a private garden with a children`s tree house and a large decked area with a table and chairs for six, a gas BBQ and a private hot tub. 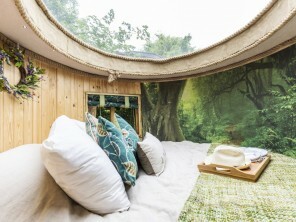 There is a hand built bespoke wood burning Sauna. There is secure parking for three cars. Linen and towels are provided. The lodge is wheelchair accessible. A maximum of two dogs are allowed per property (charge applies). A welcome pack containing lots of goodies will be waiting for you.